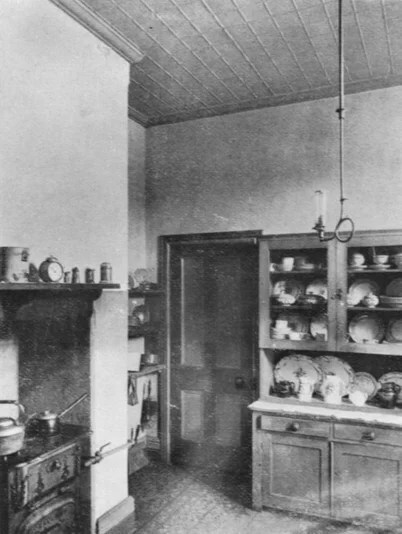 The earliest “civilised” kitchens were often located in a separate room at the rear of the house. There were open fires, food hung from massive rafters and cooking utensils consisted of clay pots and stoneware. For the wealthy and upper-class, kitchens were dirty places to stay away from. By the early 1900s, gas cooking and electricity was invented, and clean water had became prevalent. It was also the first time people were introduced to refrigerators, boilers and ovens. 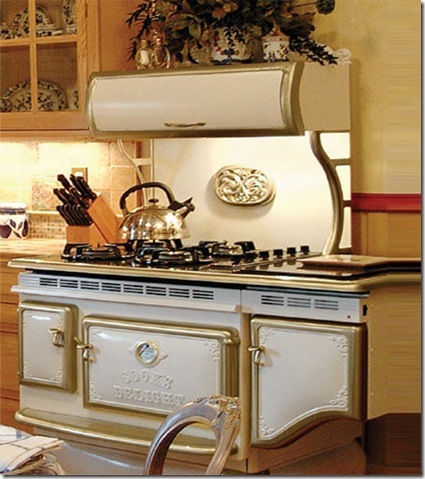 Vintage Look Hand-built quality cabinets for kitchen, bath, and other rooms. The introduction of gas, water, and electricity to homes in the 19th and early-20th century changed the way Edwardian people lived and cooked. The widespread installation of running water in the 19th century provided a huge boon to kitchens, because now sinks became a focal point of the kitchen. Large enough to carry out all manner of water-related activities, the kitchen sink was huge, heavy and almost immovable, giving rise to the colloquial phrase ‘everything but the kitchen sink’. Gas pipes provided both light and heat in the house (as well as the occasional explosion or fire), making cooking an easier task and allowing ovens to become smaller and lighter. Brick-and-mortar stoves fired with coal remained the norm until well into the second half of the nineteenth century. 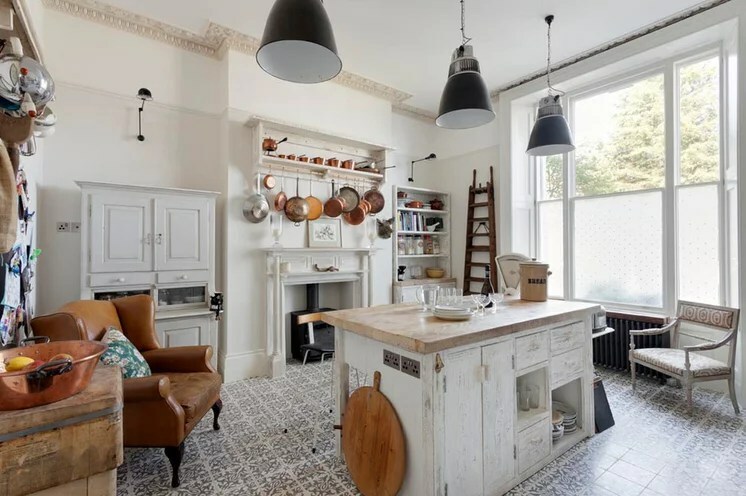 Pots and kitchenware were typically stored on open shelves, and parts of the room could be separated from the rest using simple curtains.new stoves with their smoke outlet no longer required a high ceiling in the kitchen. The kitchen floors were tiled; kitchenware was neatly stored in cupboards to protect them from dust and steam. A large table served as a workbench; there were at least as many chairs as there were servants, for the table in the kitchen also doubled as the eating place for the servants. When electricity was adopted in some pioneering Australian towns, it made kitchen life increasingly more comfortable and stimulated the invention of time-saving kitchen appliances over the coming decades. In fact, the first electric cooking stove, otherwise known as the Kalgoorlie Stove, was patented by West Australian resident and municipal engineer David Curle Smith in 1905. 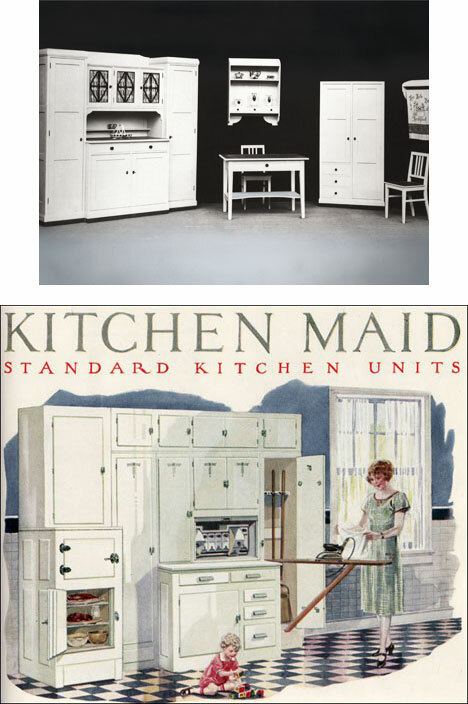 A greater interest in how to increase efficiency and promote time-saving methods in factory production (think the Ford Model T motor car and invention of the factory assembly line) flowed into kitchen design as well. 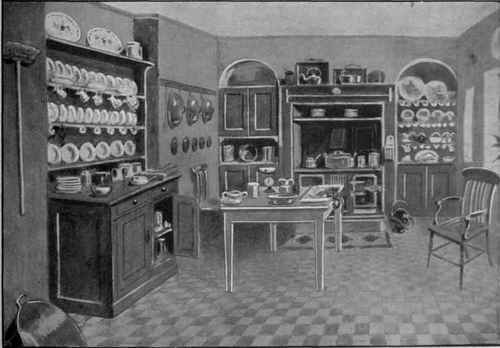 Early kitchens had very little bench space or storage because kitchen cabinets (built-in or otherwise) were not yet in production for the home. In 1899, the Hoosier Manufacturing Company (USA) adapted the existing baker’s cabinet into the freestanding metal Hoosier Cabinet. 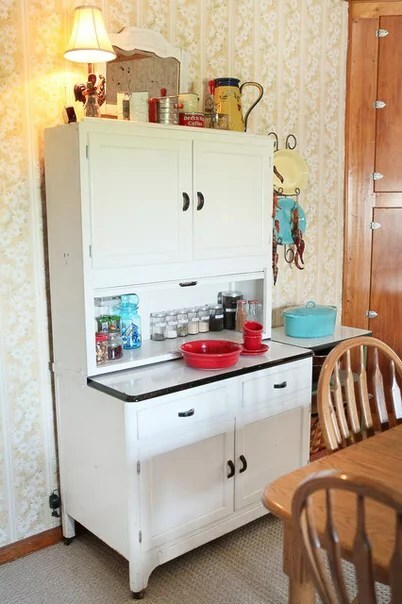 It had space-saving and functional features like upper and lower cabinetry, shelving, a flour bin/sifter and pull-out work surface. The Hoosier cabinet was compact yet large enough to provide adequate storage and make working in the kitchen that much more efficient. In Australia, the Hoosier (or one of its variations) soon became a kitchen staple, described in 1918 in The Farmer and Settler as the “principal item of kitchen furniture”, along with the cooking stove. Plenty of fuel and water, which, with the scullery, pantry and storeroom, should be so near the kitchen as to offer the smallest possible trouble in reaching them. The issue of sanitation was also one of importance, and it was advised that walls be made of white glazed tiles and floor coverings of oil-cloth and linoleum. However, this varied depending on the architecture of area–for example, flags of smooth stone were cemented together to form a smooth floor in the north of England, the kitchen floor usually consisted of unglazed red tiles in the Midlands, and on the east coast, floors were frequently laid with red or yellow bricks. 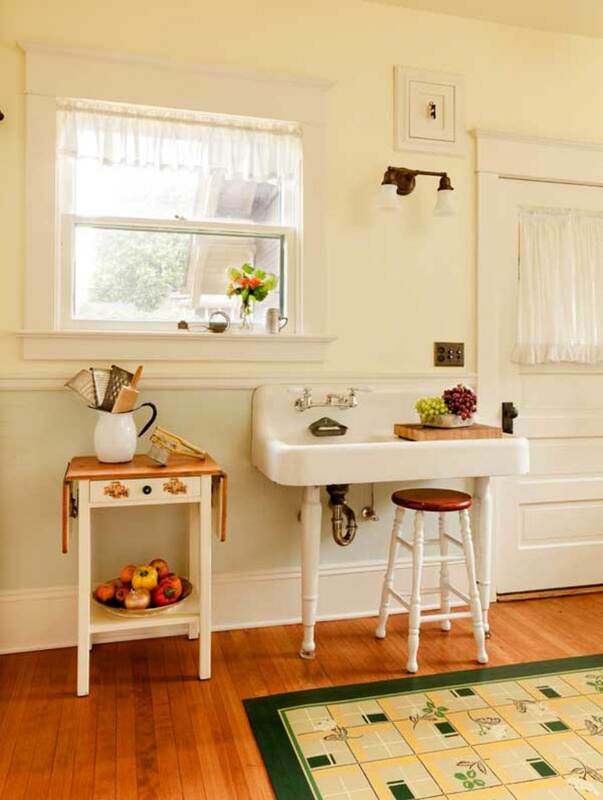 Kitchen fixtures were simple and utilitarian, and a well-constructed sink of either wood lined with zinc, stoneware, or lined with cemented tiles were recommended. 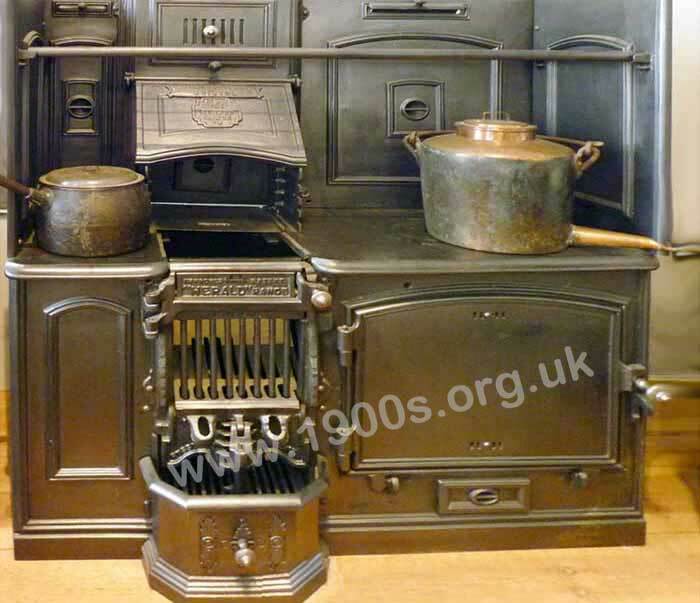 Old Victorian or Edwardian coal-fired kitchen range, also known as a kitchener. A large work table was the most important article of furniture, and the drawers at each end contained the cook’s tools, such as knives and spoons, and small utensils and implements in constant use. The last, but by far the most important of the kitchen requisites was the kitchen range, or kitchener, which was used for cooking, heating water, and so on. the gas range or stove was similar to the kitchener, but was, of course, run with gas. Oil stoves and cooking by electricity were also popular options, though the latter was incredibly expensive to run. A kitchen in tip-top form always contained a full array of utensils. There were the stewpans and saucepans of tin, copper, brass, enameled iron, and wrought steel; the boiler for boiling large joints, hams, and puddings; the digester, a small stock pot; the stock pot itself; the braising pan; the double or milk saucepan (a small bain-marie); steamers; fish-kettles; fish fryers; the frying pan; the bain-marie; the dripping pan; the gridion; and the dutch oven. Other must-have utentils were weights and scales, a mincing machine, steak tongs, knives, a colander, a pestle and mortar, a chopping board and bowl, preserving pans, sieves, coffee and pepper mills, baking dishes, tartlet pans, vegetable cutters, an egg poacher, freezing machines, water filters, refrigerators, etc. In 1892, a 33-year-old cabinet maker named Friedemir Poggenpohl opened his own workshop and an adjoining furniture store in Bielefeld, Germany, focusing on kitchen cabinetry. 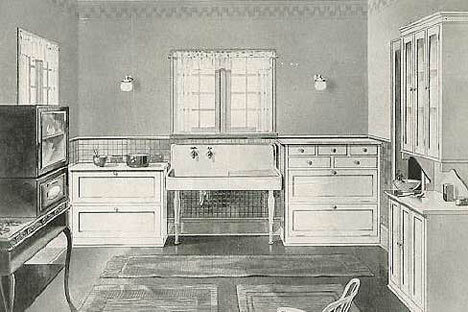 Uniquely, he produced kitchen cabinets not only in wood, but in a white lacquered finish. Friedemir Poggenpohl passed away in 1924, but thankfully he left behind a capable design and production staff that would continue to push the envelope. 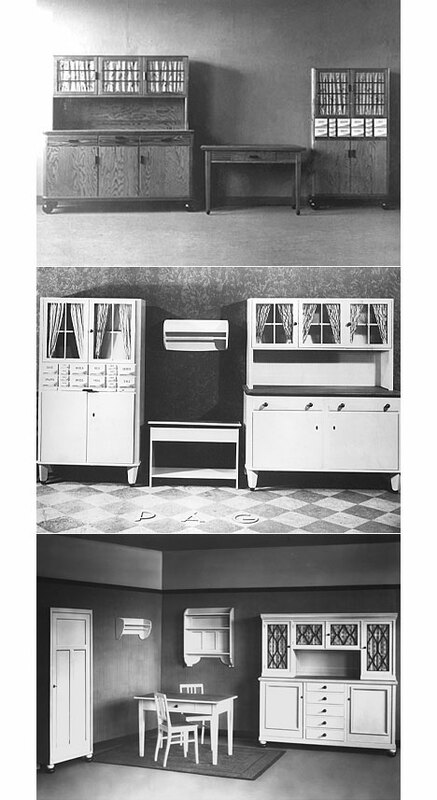 In 1928, one year before Austrian architect Margarete Schütte-Lihotzky essentially invented the galley kitchen, Poggenpohl’s company introduced the “Reform Kitchen,” seen above. It’s not yet a complete kitchen like Lihotzky’s (galley) Frankfurt Kitchen, but the interconnected cabinet modules, polished white lacquer and Modernist aesthetic were eerily prescient. Two years later Poggenpohl refined their lacquering technique into what they branded “Zehner-Schleiflack” (literally translated, “ten varnish”), which used ten processes to lay down an unparalleled surface quality. It was 1930 and Poggenpohl was probably producing the finest kitchen surfaces in the world. Prior to this, kitchen surfaces were predominantly wood, which of course aged and grew stained over time. Poggenpohl’s innovation of this era turned the kitchen into a place of visual cleanliness, making it look more like a hospital rather than a workshop. The style is often associated with American styles: Mission, Shaker, and Craftsman designs, although there are some historical differences between them. 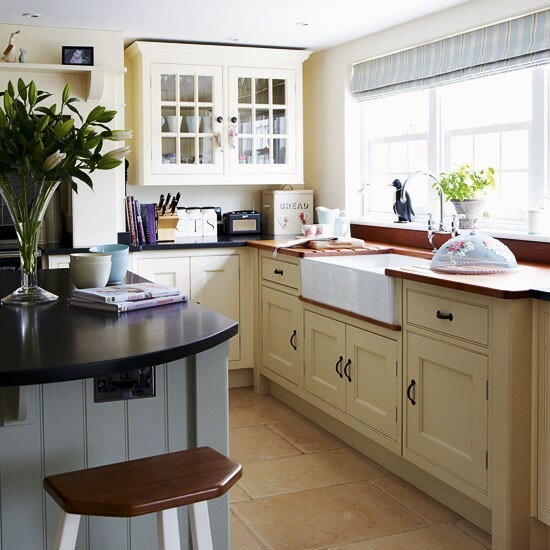 This Arts and Crafts style kitchen features traditional cabinets in quartersawn white oak, white countertops, craftsman green accents on the walls and splashback and a sizable kitchen island with a large prep sink. The Arts and Crafts movement began in England around 1890 in response to the overly ornate, assembly line furniture of the time. The movement focused on aesthetic simplicity, talented craftsmanship, and impeccable quality. 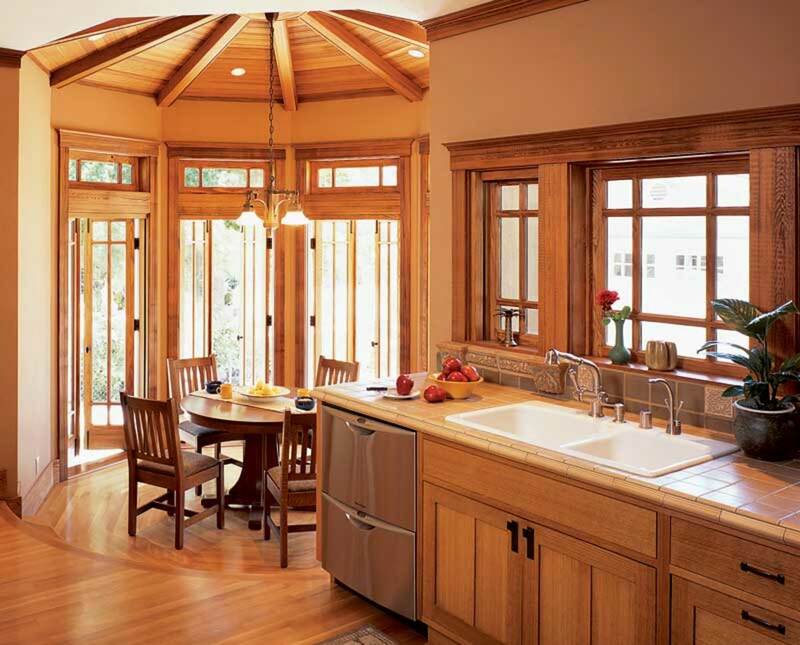 Arts and Crafts kitchen design relies on straight lines and heavy proportion. It bears some resemblance to Gothic, Shaker, and Oriental designs. 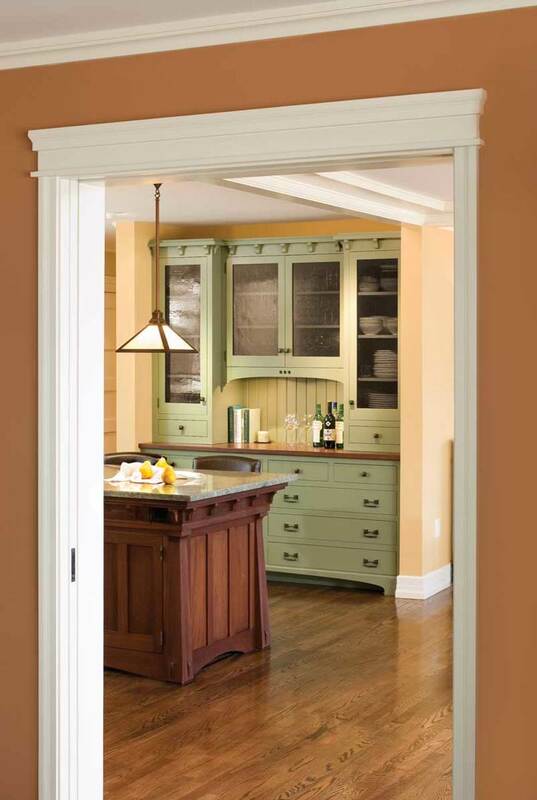 The American style often features Mission or Shaker door styles, iron or brass hardware, and Quartersawn Oak cabinets. Other appropriate woods include Ash, Birch, Cherry, Hickory, and Maple. 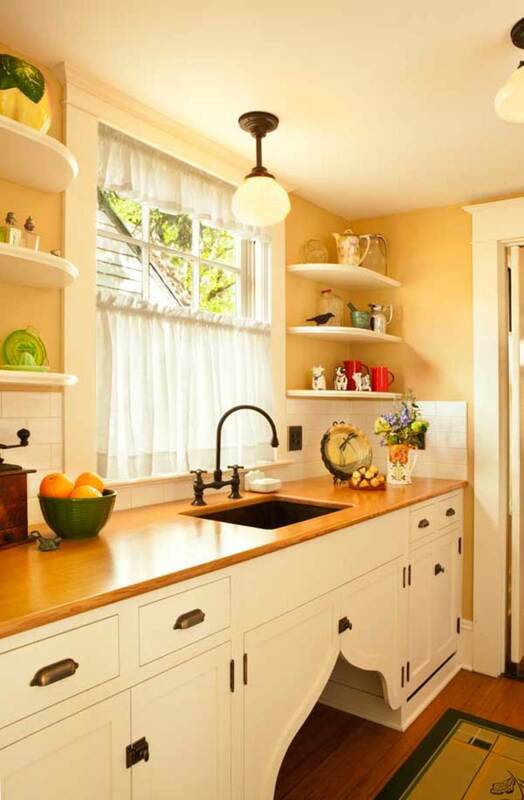 A new kitchen in a 1915 Prairie School house. 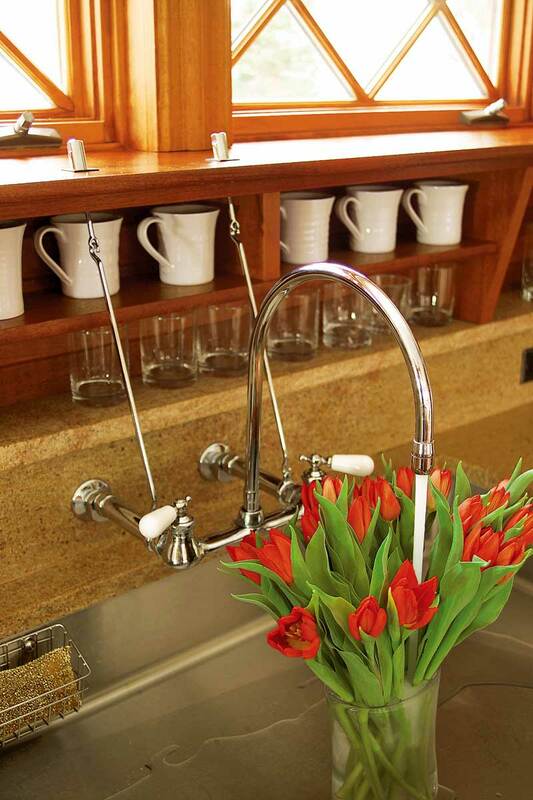 • Use several different counter surfaces. That’s more historical than installing linear yards of matching laminate or granite—and it’s practical. Pick something nonporous near sink and stove, butcher-block for prep, perhaps a marble slab for baking or pizza making. You may even be able to save on remnant or salvaged material for small areas. Right: The antique work table was rebuilt and enhanced with a shelf; the door to its left is a pass-through for milk bottles. 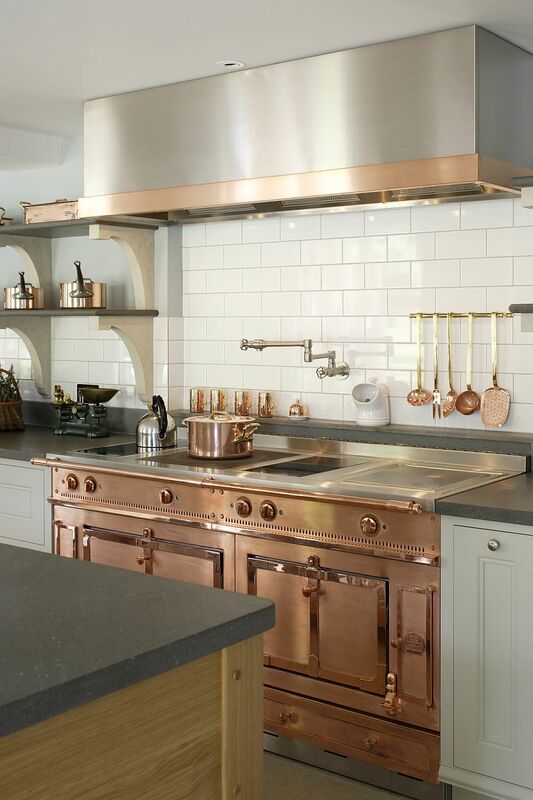 Wood countertops surround a copper sink. The antique work table was rebuilt and enhanced with a shelf; the door to its left is a pass-through for milk bottles. 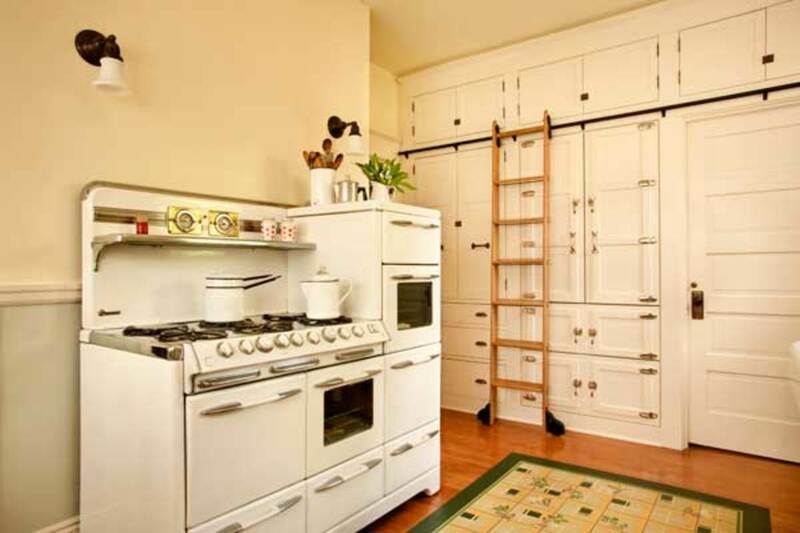 … “The back kitchen had been virtually untouched since the 1920s,” Jack says. It was one big room with no built-ins or cabinets and, oddly, a 6½’-long sink that blocked the basement door. A separate butler’s pantry had been the functioning kitchen since the 1970s. “We agonized over what to do for years,” says Jack. Meantime, they removed wallpaper in the dining room, revealing signs of the original built-ins. 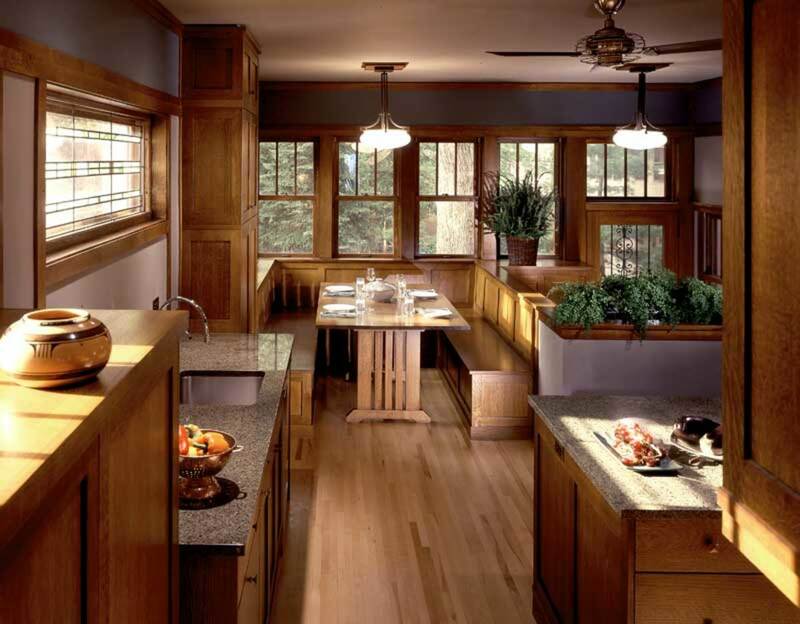 Jack, who is a talented woodworker, rebuilt them with wood countertops. The new floorcloth was copied from a remnant of old linoleum. Vintage canisters on the old stove add color. A vintage toaster in the pantry. This wall originally held a dumbwaiter and utility closet. 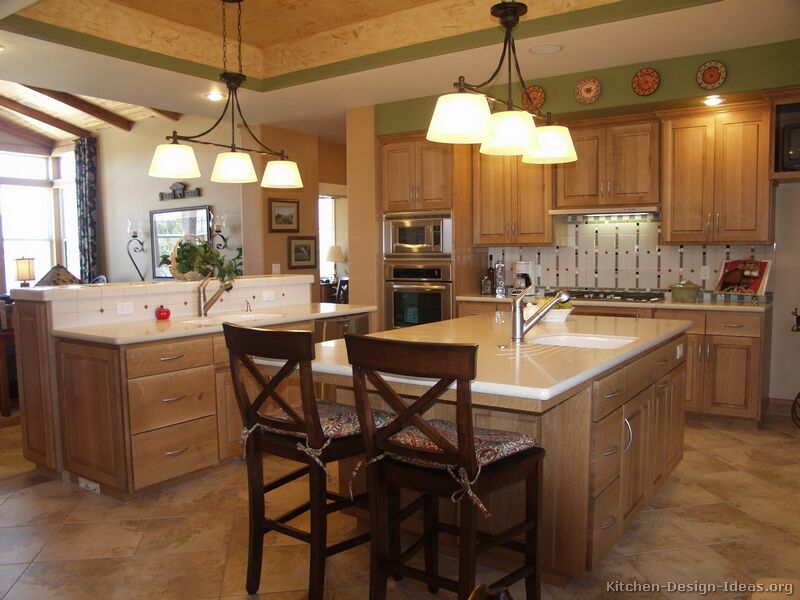 Refrigerator, sink and range form the work triangle, while the island functions as a prep area. 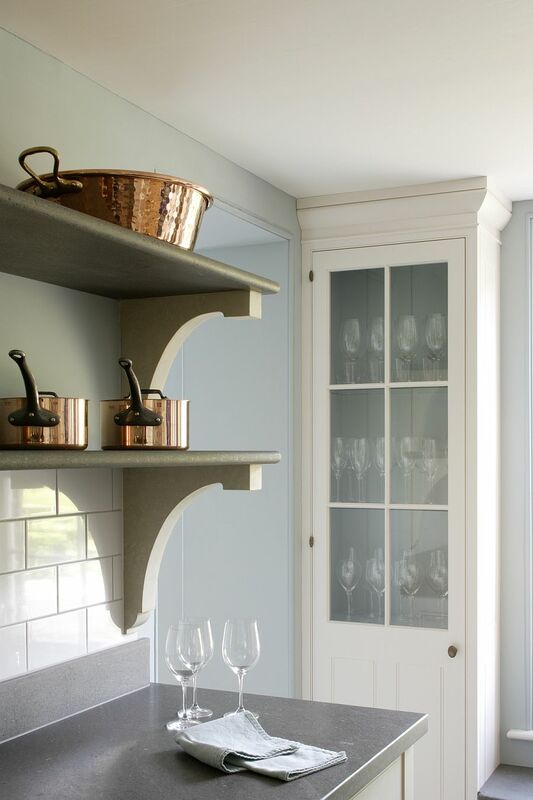 Concealed lighting casts a glow behind the arch and beneath cabinets. Over the years, architect John Malick and his wife, Sue, have seen their house evolve. With an empty nest, they decided to absorb two former bedrooms into a larger kitchen—without changing the footprint. The 50-year-old house sat on a narrow lot in Piedmont, California; buying the adjacent lot allowed them to plan outdoor space at the rear. Now the breakfast room opens to a lawn and garden. The new kitchen is generous—over 10′ x 16′, and filled with light. 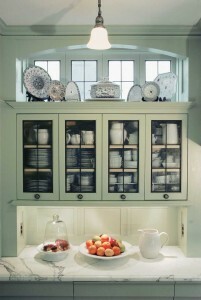 In renovating the house, Malick leaned toward an eclectic British Edwardian style, and the kitchen is in the same vein. The work of C.F.A. Voysey and other designers of the period inspired moldings and the gently arched openings. The layout, which is balanced but not strictly symmetrical, is organized around a central island. 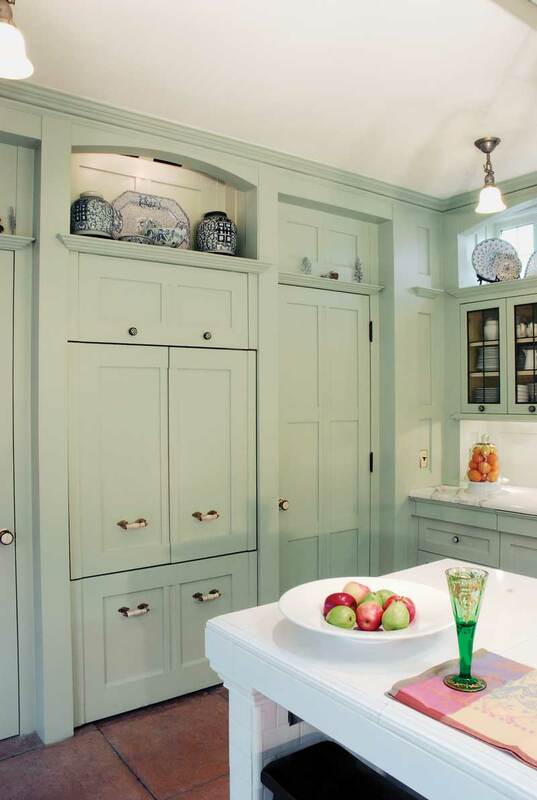 The green-painted cabinets and stile-and-rail paneling that covers wall surfaces plays against the lawn and hedges seen through windows on three sides of the room. “I get a lot of inquiries about the paint color,” Malick says. “The green was custom-mixed on site; its depth makes it highly responsive to light.” In neutral light, he says, it’s a subtle mint color; indoor lighting warms it. 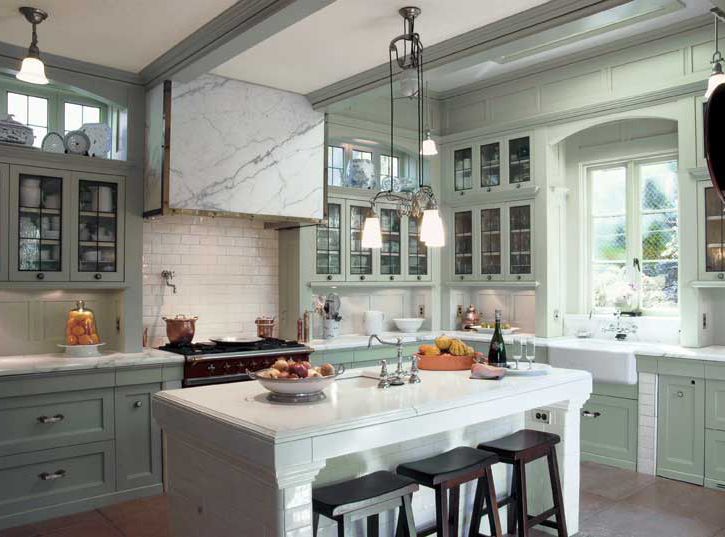 The room is further brightened by light reflected off the Calacatta marble used for countertops, steps, and stove hood. Underfoot, concrete floor tiles cast from an antique arabesque pattern add movement. 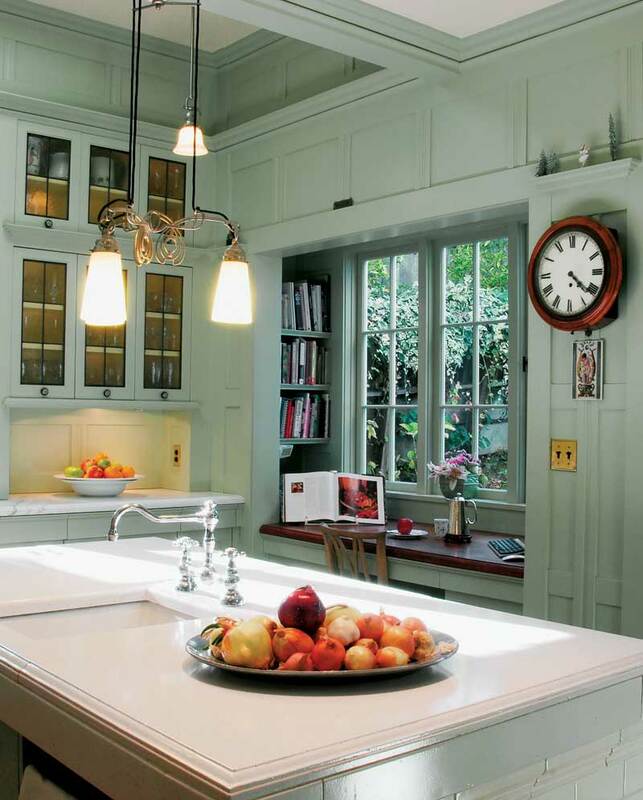 Each window is framed by casework that extends to the countertop. Recessed down lights are concealed behind arches, both over the sink and highlighting clerestory windows above cabinets. In a shallow nook just outside the busy work triangle, a built-in desk overlooks the garden, flanked by shelves for cookbooks. A large opening next to the desk connects the kitchen to the breakfast and family room.